Concrete Mixer Rental – Stone 65CM Concrete Mixer, is available for rent from the Duke Company in Rochester NY, Ithaca NY and the entire Western New York region. 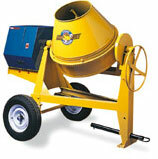 For heavy duty projects, this side dump concrete mixer has a steel drum diameter of 30″ and capacity of 6 cubic feet. Equipped with towing tires and tow pole.